Hot water extraction, commonly referred to as “steam cleaning,” is our preferred method of carpet cleaning–not only because it does a wonderful job–but also because is the only cleaning process approved by carpet manufacturers to keep your warranty intact. Steam cleaning uses very hot water and powerful suction to wash and rinse your carpets, leaving no soap and minimal moisture behind. Vacuuming – Every steam cleaning performed by SRQ Carpet and Tile Cleaning begins with a vigorous vacuuming of the entire area. Over 80% of the dirt in your carpet is dry soil and can be removed by vacuuming. Furniture Moving – We always move small tables, chairs and home décor items. Heavier furniture can moved by special request, but must be properly prepared prior to our arrival (no fragile items or electronics). Please refer to “Preparing for Your Cleaning” for more information. Application of Cleaning Solution – A fiber-specific cleanser is sprayed onto the carpet, which begins to break down dirt, oil and odors. Agitation – Based on the level of soil, a counter rotating brush machine can be used to scrub the carpet before the steam cleaning. This machine works the cleanser into the entire carpet fiber, working out stains, pulling out pet hair and lifting matted high traffic areas. 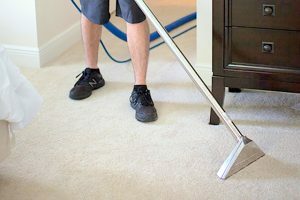 Rinsing – After allowing adequate dwell time, the carpet is thoroughly rinsed with pressurized hot water and a rinsing agent that removes soil and soapy residue from the carpet, leaving it clean and soft. Drying – Thanks to our powerful equipment, the carpet will only be slightly damp to the touch after your steam cleaning and carpets only need 4-6 hours to fully dry. If you need to walk on the carpets right away, ask us for some complimentary booties to slip over your feet. Scotchgard Carpet Protector – This optional protectant can be applied to restore your carpets’ protective barrier, helping to reduce future stains and premature wear. Grooming – A specialized rake is used to spread carpet protector evenly throughout fibers while also standing up fibers to promote faster dry times.